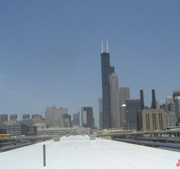 Welcome to Roof Consultants, Inc.
We offer roof consulting and services primarily in Chicago, Illinois, Indiana and Wisconsin, but will travel nationally to accommodate our clientele. With over 30 years of experience in the roof consulting industry, our professionals specialize in roofing inspections, evaluation, design and management services. Why do you need a roofing inspector? If you are having any roofing work done on your building, you must consider having an on-site third-party observer on the site. An improperly installed new roof will result in premature failure, leakage, interior damage and voiding of any manufacturer's warranties. If there is a job site injury it has a compound effect on everyone including the owner of the property and the architect. Over 70% of all construction litigation involves roofing installations. Roofing is the second highest rated trade for Workman's Compensation due to injury and claims made. Not all contractors install all roofs according to written specifications and industry standards. Studies show that 15%-18% of all roofing systems installed will fail in less than 5 years due to poor workmanship and design. Our professional site managers are familiar with all current roofing procedures to insure the roof system is installed properly so that it will fulfill it’s designed, serviceable life. Architects, developers and contractors are liable for mold issues related to moisture intrusion due to wet materials being installed and poor quality workmanship. Contact the professionals at Roof Consultants today to ensure sound roofing service practices and protect one of your most valuable investments. Call (708) 846-4410 or contact us online. Serving in and around the Midwest for over 30 years.